Warrandyte will ever be associated with Clara Southern. Warrandyte was Clara Southern’s home for thirty-five years, and in her works she captured the very spirit of Warrandyte. 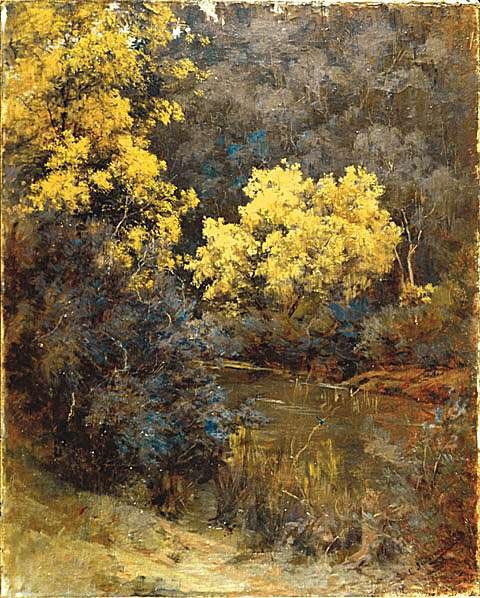 She depicted the village with its pub and wooden buildings; she depicted the old bridge and miners’ cottages surrounded by blossom trees; and here in this Winter scene, she depicted a cool, quiet corner of the Yarra River with the wattle in bloom and an inquisitive male fairy wren perched on a twig above the stream.